Let's all take a moment to agree that Back to the Future is one of the greatest film trilogies in the history of cinema—regardless of Part III's hokey nature and flagrant disregard for, um, science. 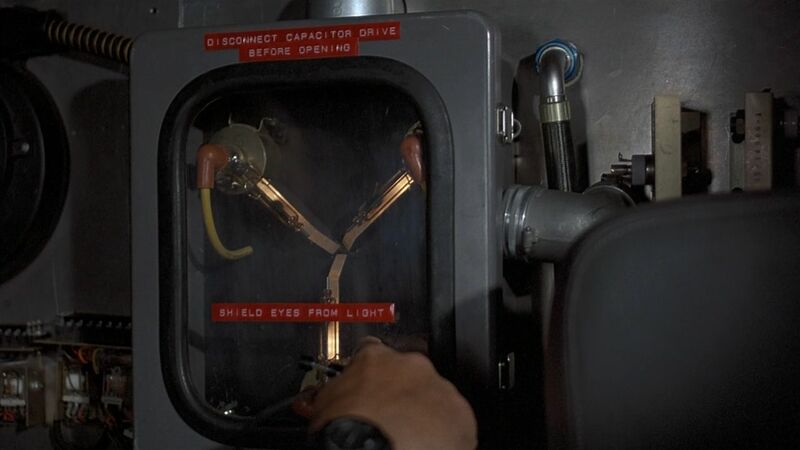 Since its premiere, the amount of merchandising to come out of this franchise is nothing short of inspiring: Marty McFly's futuristic kicks, the Flux Capacitor phone charger, the LEGO DeLorean, and now, a supremely badass Flux Capacitor Wristwatch. Two words. Ten letters. One point of exclamation: GREAT SCOTT! Unlike this wrist candy's high-end, expensive counterparts, the Flux Capacitor watch wows its wearers by being in a constant state of "flux," meaning your friends will definitely run out of hyperbolic adjectives to describe your wrist on the daily. To read the time, you simply push the button on the bottom and count the number of lights. For example, 12 lights, four lights, and two lights equals: 12:42. An LCD display will also show you the date—you just need to make sure it doesn't pre-date your birthday. Movie references, am I right? Both the band and case are made from 100% stainless steel, and a battery comes included in a snazzy box, all for just $50! What's not to love? A wearable piece of movie memorabilia that keeps time and impresses your friends? All of your peers will love it—especially the one that got away. Winky face. Jeremy Glass is the Vice editor for Supercompressor and firmly believes Marty McFly should have played "The Power of Love" over "Johnny B. Goode" during the Enchantment Under the Sea dance. He wrote a thing about it once: check it out.